Tania believes strongly that yoga is a practice that is suitable for everyone and one of the first groups she started working with was elderly people, including those living with dementia in residential care homes. It was through this work that Tania first met Professor Martin Green (Care England) and Maggie Candy who managed Marlborough Court Nursing Home (part of the Four Seasons group). Maggie has a progressive approach to managing this home and had turned a failing ‘facility’ into an award winning place that felt like a real home. Maggie was keen to introduce yoga to her residents and Maggie, Hayley (the activities coordinator) and Karen (one of the carers) started to introduce yoga-based exercise routines into the home in mid 2014. Marlborough Court had a dementia focus and Maggie thought that this unit would specifically benefit from the yoga. Dementia is a growing issue for those living with the condition and their carers. Symptoms include loss of memory, difficulty preforming everyday tasks, language problems, disorientation in time and space, misplacing things, changes in personality including depression, anxiety and anger and loss of initiative. Dementia costs the UK economy £23 billion a year (more than cancer and heart disease combined). It is estimated that by 2021 there will be one million people with dementia in the UK, with numbers doubling every year and no known cure. There is therefore an urgent need to develop and test interventions to improve the lives of those living with dementia and their carers. Through Tania’s work in the Tower Bridge Nursing home she was convinced that yoga would benefit people living with Dementia. Yoga and mindfulness based exercises have been proven to be an effective intervention for a number of common conditions that present in clients with living with dementia – for example: anxiety, depression, co-ordination and balance problems. McCall (2007) has also shown yoga to be an effective intervention for helping to alleviate other common conditions presenting in residential care environments such as Heart Disease, High Blood Pressure, Insomnia, Osteoporosis, Osteoarthritis, Post-Joint Replacement, Post-Stroke Rehabilitation, Rheumatoid Arthritis, Stroke, Urinary Bladder Dysfunction, and Urinary Stress Incontinence. 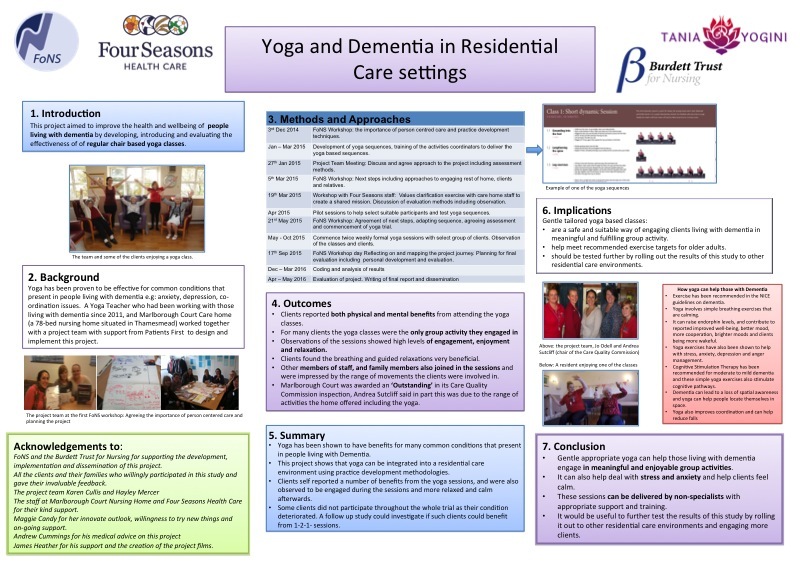 Tania presented her ideas on Yoga and Dementia at the Marlborough Court carers training day and was delighted when Dr Teresa Shaw from the Foundation of Nursing Studies suggested Tania and Maggie apply for a grant as part of their Patients First program (which sought to support practice development projects). They were successful in their application for a small project to formally introduce and test a yoga program specifically for dementia clients. This project sought to trial a number of yogic interventions with clients with dementia over a 6-month period. The interventions introduced simple exercises that combined movements with breath, breathing exercises, mindfulness practices, chanting and partner work. It was able to further research and evaluate these exercises, and overcome workplace barriers to introducing these new techniques. It provided evidence of the outcomes of these yoga-based techniques. In the end the trial ran for 18 months was very successful and the yoga classes continue to run in the care home. The project is now concluded and the final report is available here. A shorter Improvement Insights summery is also available here. You can also see a documentary about the project on our Video Testimonies and Documentary Page. Our book will be released on the 21st February 2018 and is currently available to pr-eorder for delivery on Amazon – simply click on the picture below. You can also order direct from Jessica Kingsley – click here. We have created many safe sequences for people with reduced mobility. All our sequences have options for everyone including those who are less able to stand or perhaps even move without help. We believe yoga will benifit people living with all stages of dementia from the first symptoms through to being bed bound. It is also proven to be helpful to stave off the future prospect of dementia. Please get in to touch to find out more. Tania and James are both experienced qualified yoga teachers who specialise in working with older people. Take a look at their individual pages under the about us tab or click the below links.